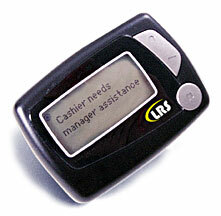 Guest pagers make great first impressions, making patrons confident they will not be forgotten during rush hours. Reduce walk-aways, increase table turns and enhance the dining experience by quieting the chatter from repeated guest calls. Even call guests' cell phones automatically! Easier to install than most stereo systems- no wiring, construction or programming necessary. 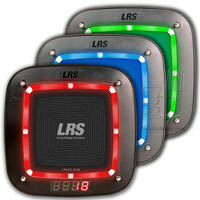 FoodSoftware.com offers complete restaurant guest paging systems for the lowest prices anywhere. 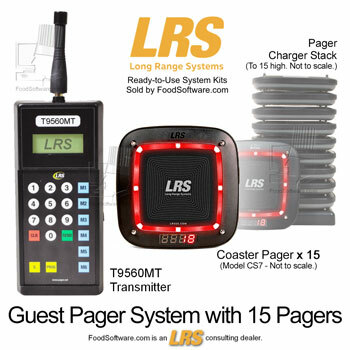 This system kit includes 15 guest pagers, an ideal number for restaurants with maximum wait times of one hour with fifteen parties waiting. 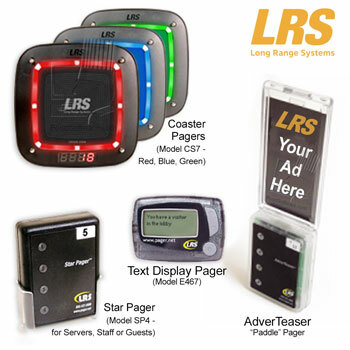 Additional individual pagers may be purchased separately and we also offer larger systems (see the next section). An upgrade from the MT to the T7470 Freedom transmitter is available that offers more range, programing features, manager paging and texting or cell phone paging via internet connection. If your facility is located in a mall, shopping center or campus, pagees may need greater flexibility so they can shop or wander while they wait, and may want a call or text on their cell phone. Guests are handed pagers if they prefer to wait close by, or with optional cell phone paging, they can give their cell phone number so they are called or texted instead. 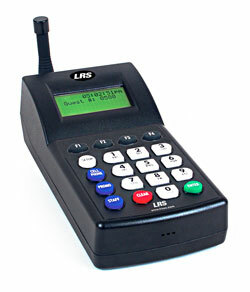 Cell phone paging uses a pre-recorded message voice message or text from your restaurant. Cell phone paging is great when you are located near other restaurants where guests tend to put their names on multiple lists and see who calls them first. Cell phone voice paging or texting requires an internet connection to the T7470 unit. 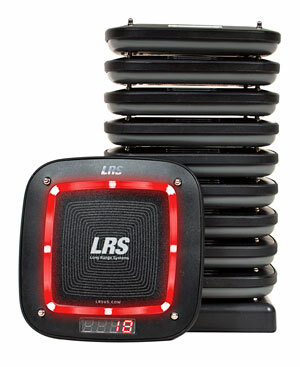 Voice or text message units are available in unit block of various sizes that are sold separately. 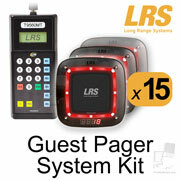 Works with all LRS pagers. Sends text to text-display pagers.